We Were Strangers Once, Too. 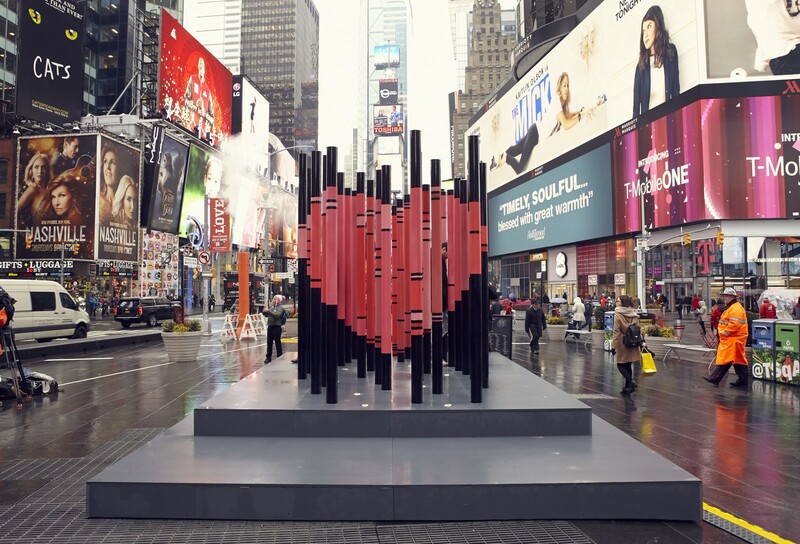 Photo Courtesy of Justin Bettman for Times Square Arts. 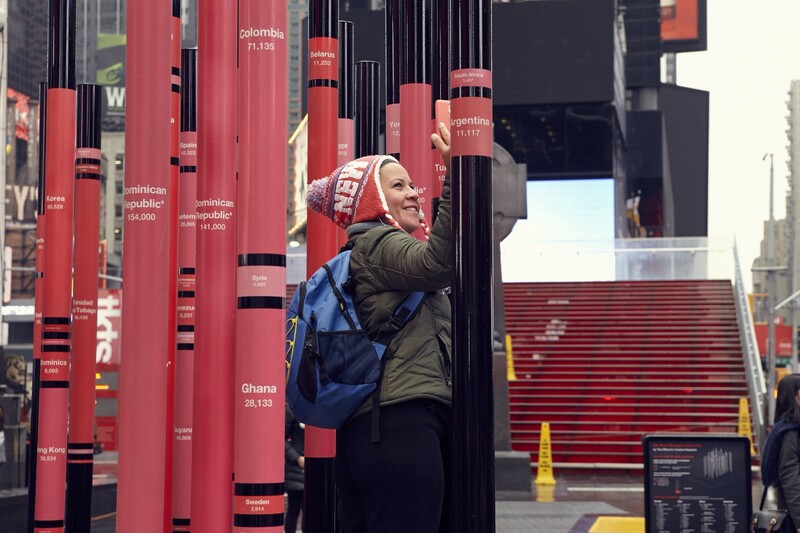 The Office for Creative Research installed an immigration-themed data sculpture this morning in Times Square titled ‘We Were Strangers Once Too’. The following is a transcript of a short statement I made to the press. There are three million people living in this city who were not born in America. In the summer of 2010 I was one of the freshest of this number, having just emigrated from Vancouver. I arrived here during the hottest week ever recorded in NYC and on those first sweltering days I’d get up before the sun rose and set out on long walks from my apartment on 113th and St. Nicholas to the tip of Battery Park. I remember that on my first long morning walk I found myself right here in Times Square, in front of the statue of Father Duffy. Two Canadian immigrants tying to find a bit of shade on a summer morning. There is something about the enormity of this place that can make you feel very insignificant. You can stand here in the middle of Times Square and let the crowd wash over you and you can feel like you are on the edge of disappearing. But at the same time you can’t help but feel like you are a part of a grand human experience, sharing this moment in time and space with thousands of other humans. That morning I remember standing here and thinking for the first time, just three days in, that I was a New Yorker. It was such an exciting thing to think that I decided to try saying it out loud, at first embarrassedly and under my breath, then a little louder, and eventually at full voice. I don’t think it was the first time that hot dog seller had heard that. 3.2 million people. The biggest foreign born population of any city in the world. We submitted our proposal for the piece I’m standing in front of a few days after Donald Trump was elected president. There’s no doubt that this piece was conceived as a reaction to that moment, a way for all of us at The Office For Creative Research to voice our alarm at the kinds of things we’d heard during the election. Border walls. Muslim registries. Racist epithets shouted at rallies. Actual, real life Nazis. Since November, that alarm has gotten louder every day. Campaign promises have turned into executive orders, into immigration bans, into broken families, into five year olds in handcuffs. The thing is these that kinds of hateful, xenophobic policies really depend on one thing: belief in the concept of the other. That a line can be drawn between you and I. Between you and this other group of people that don’t look like you. Between you and those that that speak a different language, or pray to a different God. I believe that this city has always known this to be a lie. That there is no such thing as the other. That no line whatsoever can be drawn between us. It has always been, and will always be a city of immigrants. Our boardrooms and kitchens and factories and schools and streets are filled with people from Mexico and China and Canada and Sweden and Nigeria and the Dominican Republic. From Iran, Iraq, Libya, Somalia, Sudan, Syria and Yemen. Jer Thorp is an artist, writer & teacher. He is Innovator-in-Residence at the Library of Congress. His book Living in Data will be published in 2020 by MCDxFSG.